The attempts at overhauling our healthcare system are bringing to light some of the serious problems in our political and social system today. Heaven help us! There are serious financial, quality and fairness issues that require healthcare reform. But I fear the polarizing political situation around this issue may prevent rational discourse and a reasonable solution. Resolving the problem requires engagement, honesty, integrity, collaboration, compromise and innovation. What are we seeing? Politics as usual; or worse. Most disturbing is the campaign of disinformation and bully tactics occurring at the town hall meetings. Senators and Congressmen are getting shouted down from hysterical people who seem, in many cases, completely misinformed. For example, the whole euthanasia thing...people actually believe the healthcare overhaul solutions being supported will lead to euthanasia. Or the "government takeover" mantra. 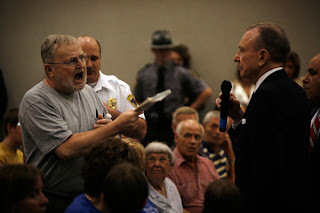 There are people at these meetings who don't even realize that Medicare is a government program. Is there anyone who would like to do away with Medicare? Probably, but not many. The government backed healthcare option being offered is similar to a Medicare program. Now reasonable people disagree as to whether this is a viable option ...but claiming it represents a government takeover is inaccurate at best and flagrantly dishonest at worse. We must defuse the emotionality and clarify the real issues. Responsible politicians, healthcare providers and administrators, the insurance industry, community leaders, lobbyists and others need to avoid the incendiary rhetoric and focus on informing people of the facts. We as citizens also need to take responsibility for understanding the issues. Yes, smart people will disagree on what solution is needed. But we require and deserve Leaders with Integrity from all sides of the debate to support a rational process of reform; only then will we move closer to what most of us want--affordable, accessible high quality healthcare for all Americans. We can only hope rationality and dialogue will prevail! The American people deserve much more than the misinformation it is being fed.